Daniel Coston's "Front of stage, 2016"
As reported by Creative Loafing in May, The Milestone Club in west Charlotte is facing an uncertain future. 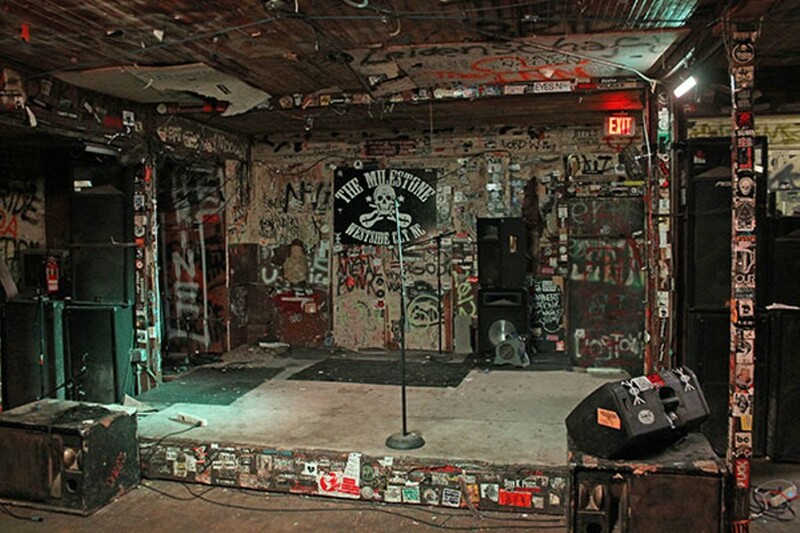 The club, which opened in 1969 and has since propped up countless local acts in Charlotte while also playing host to iconic bands and singers ranging from Bo Diddley to Nirvana, needs renovations in order for investors to help current management purchase the property and continue to rock. In the three months since launching a GoFundMe campaign to "Save The Milestone," co-owner Jonathan Hughes and his wife, Stephanie, have raised more than $41,000 to go toward the much-needed renovations — which they've already started work on — but still need over $100,000 to reach their goal. No matter what the future holds for The Milestone, it can't be denied that some of Charlotte's greatest musical moments have taken place within its walls. Those moments are the subject of a new exhibit that opened on July 16 at Levine Museum of the New South. A Milestone In History: You Should Have Seen What I've Heard will feature a selection of photos taken at The Milestone over the years by Charlotte photographers Daniel Coston and the late Chris Radok. In the days leading up to the exhibit's opening, Creative Loafing reached out to Coston to ask which photo in the selection is his favorite and why. Representatives of the Radok Brain Trust suggested that we speak with Kate Baillon about Radok's work. Baillon is vice president of exhibits at Levine, a long-time supporter and fan of The Milestone and an old friend of Radok's. As opposed to specific shows caught on film, which I thought each would choose in accordance with their own fandom or specific experience at a given show, both Coston and Baillon chose photos of empty rooms at the historic club; rooms that have become iconic in their own right and have witnessed the best (and worst) to take place at The Milestone over nearly a half century. Daniel Coston, "Front of stage, 2016"
"That stage. The graffiti. The dirt on the floor. I know it all very well. The number of bands, and the list of legendary bands that have played on this stage is staggering. When I began compiling my photos for this show, I started looking for another way of speaking to what the Milestone has meant to me. In the end, I decided to focus not on all of the musicians that I've documented at the venue over the years, but instead let the Milestone Club and its personality speak for itself. Think about all of the people that have inhabited that space since 1969. People can pass through a space, and change it by the force of their experience. The Milestone still speaks to all of that. You can't fake or re-create real character or longevity, and the Milestone has a lot of both. 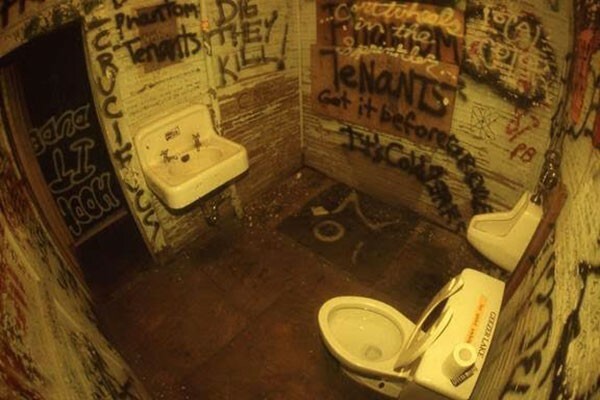 Chris Radok, "Bathroom at the Milestone, August 1992"
Chris Radok's "Bathroom at the Milestone, August 1992"